Univision executives like to say that the road to the White House runs through the Hispanic community. "This argument will be tested today," Univision's top anchorman Jorge Ramos said Tuesday. Donald Trump defied the argument, declining Ramos's repeated entreaties for an interview, despite the fact that Univision (UVN) is the dominant TV network among Spanish speakers in the United States. Trump also openly sparred with Univision during the campaign, kicking Ramos out of a press conference at one point and suing the network in a separate business dispute. The suit was later settled. Univision is a broadcasting brand name. Many English speaking Hispanics also know the network well and consume its bilingual content. "The only other candidate that didn't want to talk to us was Bob Dole in 1996, and lost," Ramos told CNNMoney. "Regardless of the results, I think Trump will be the last candidate who tries to win without the Latino vote." Hillary Clinton's campaign courted Univision and another Spanish language broadcaster, Telemundo, early on, in a clear contrast to Trump's approach. Kristina Schake, the campaign's deputy communications director, said, "Latinos have always been an important part of the Hillary coalition." On Tuesday Schake and a number of other Clinton allies predicted that a surge in Latino voting — spurred partly by Trump's offensive remarks about Mexican immigrants — would be a prominent story on election night. "We started talking with Univision and Telemundo in the spring of 2015," Schake said Tuesday afternoon. 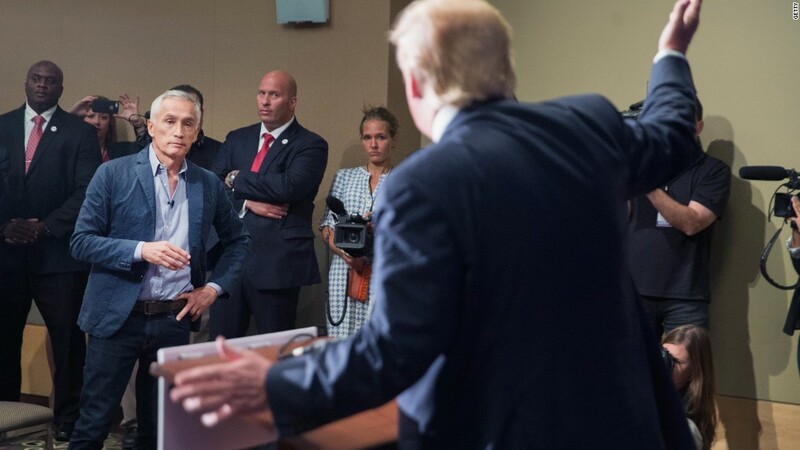 Univision's Jorge Ramos confronted Donald Trump. Schake said Clinton made it clear during the primary season that she wanted multiple Spanish language spokespeople on staff, plus numerous surrogates who could appear on networks like Univision. Trump belatedly added Spanish speaking surrogates, but Ramos' co-anchor Maria Elena Salinas said "no one from his campaign" agreed to appear on Univision. "We asked for interviews with kids, nothing. We had Mike Pence booked and he canceled," she said. Ramos noted that when he requested an interview with Trump in the summer of 2015, Trump published the note — divulging the anchorman's cell phone number — on Twitter. "At some point, he even said publicly that he was going to talk to me and/or Univision, but it never happened," Ramos said. "I think he gave up on Latinos. He believes that he can win without the Latino vote and that goes against the demographic trend in the U.S."
Clinton, on the other hand, participated in two debates and forums on Univision. She also appeared on one of Univision's entertainment talk shows, "El Gordo y La Flaca," in Miami in late October — one of her final TV appearances of the campaign. Ramos said he senses that Latinos are highly energized to vote. "I don't remember a drive to vote as strong as in this election," he said. That may be partly thanks to Univision. While the network rejects the notion that it is biased in favor of Democrats, it prioritizes a different form of advocacy -- speaking on behalf of its audience and boosting the political power of Hispanics. Univision has led an extensive voter registration effort this year and has aired many get out the vote ads without saying who to vote for. "One of our lines is 'don't let others decide for you,'" Salinas said. "We never tell them who to vote for, just to let their voices be heard." Telemundo also organized an exhaustive voter campaign with the title #YoDecido. On Tuesday the broadcaster issued a press release saying its effort helped fuel "record-breaking voter turnout." Telemundo and NBC anchor José Díaz-Balart was quoted saying, "If there is a story I have been waiting to report during my more than 30 year career, it is the story of the Latino vote awakening. The level of Latino participation will forever change the political landscape of the country."